Hila Aflalo is a naturopath and veteran lecturer on complementary medicine, mainly nutrition and detoxification. She holds a BA in behavioral sciences and an MBA in business management, specializing in business management psychology. Hila completed a hospital residency in combined natural and conventional medicines. She also trained naturopaths in natural medicine colleges. She has been researching and working on emotional eating and body image in recent years. She offers workshops in that field, mostly for women and adolescents. Hila owned a small boutique family winery and was a founding partner of an education start-up that was later sold to a larger company. She was also the owner of an Italian catering company, “Dripping Cream,” which gradually morphed into healthy cooking workshops. Hila started out as a heavy smoker, addicted to diet cola and coffee, and then slowly weaned herself from these bad habits. Every year her plate looked different as she underwent an extensive trial and error process to arrive at the proper nutritional program for herself. Today she feeds on a vegan diet. 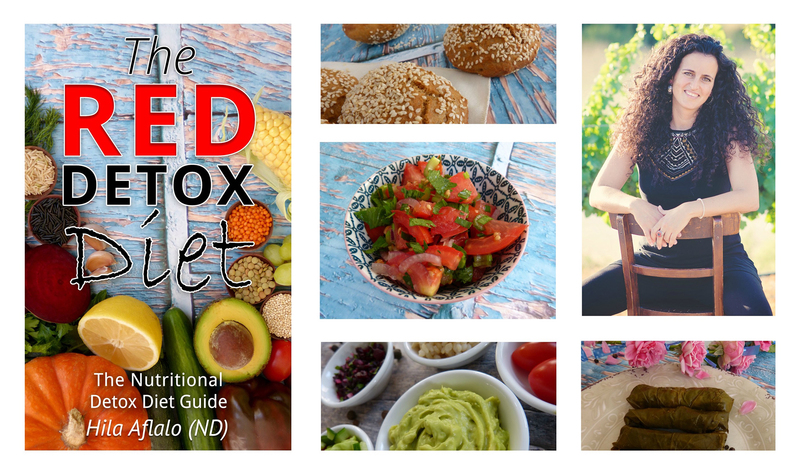 Hila has been teaching the Red Detox Diet cleansing method for more than a decade, and her students are the ones who encouraged her to write the book “The Red Detox Diet”. Hila is married with three children, a dog, and a cat. She lives in a small village in a vast national park, likes to run in fields and forests, and in her free time rides a bicycle and swims. She even once did a triathlon to see that she could.